BACKGROUND AND PURPOSE: Although commonly acknowledged as paramount in significance, the mechanics of cyanoacrylate polymerization remain poorly characterized and quantified for clinical applications. This prompted development of a simplistic model for the systematic study of polymerization and binding behaviors of cyanoacrylates. METHODS: A sliding bed apparatus was constructed that linked a strain gage with a vessel that could be filled with liquid medium, cyanoacrylate, and a microcatheter. As the cyanoacrylate polymerized, the microcatheter was mechanically drawn away very slowly from the fixed vessel, resulting in the development of forces that were recorded to characterize the dynamics of polymerization and binding. Optimization of the model required manipulation of several variables that could influence polymerization. Three different formulations of cyanoacrylate were also tested to determine whether there are significant differences in polymerization dynamics. RESULTS: After experimenting with a few basic physical parameters of the test apparatus, consistent measurements of binding forces during cyanoacrylate polymerization could be recorded and measured. Polymerization produced a multiphasic pattern of binding forces, in which three distinct phases were observed. Furthermore, the rates of polymerization were significantly influenced by a variety of parameters, including the type of fluid within the model vessel, geometry of the model vessel, and rate of injection of acrylic into the well. Furthermore, there were significant differences in the pattern of dynamic binding forces among the various formulations of cyanoacrylate tested. CONCLUSIONS: A standardized bench top testing apparatus has been developed, which can consistently show dynamic binding related to polymerization of cyanoacrylates. This preliminary study shows a clear multiphasic pattern of polymerization binding, which may have important clinical implications. The apparatus may be useful for gaining better insight into a variety of clinically important phenomena related to cyanoacrylate polymerization. The role liquid adhesives in the therapeutic embolization of cerebral arteriovenous malformations has become increasingly important in the overall management of these vascular malformations. Embolization of cerebral arteriovenous malformations with cyanoacrylate has been performed for 2 decades, a period during which there has been tremendous evolution in both technique and technology, including the development of different formulations of acrylic and evolving microcatheter and microguidewire technologies (1–18). A variety of injection techniques have been used for the delivery of cyanoacrylate into targeted cerebral arteriovenous malformations, including the continuous column and sandwich techniques, both of which can be performed in either free flow or flow arrest conditions (1, 4, 5). Regardless of the specific technique used, the essential feature of embolization using liquid adhesives is to deliver a mixture of cyanoacrylate and usually iodinized oil (with or without powdered tungsten or tantalum) through a microcatheter that has been superselectively positioned within a feeding vessel. The ideal goal is to permit permeation of the embolic material into the nidus of the cerebral arteriovenous malformations, eliminating the site of arteriovenous shunting. Deposition of embolic material too proximally or too distally can result in either suboptimal technical results (eg, incomplete therapeutic occlusion) or serious clinical complications (19, 20). Therefore, understanding the behavior of the polymerization process is crucial for optimal technical and clinical results. Although it is commonly acknowledged that certain physical properties of cyanoacrylates are crucial for permitting safe and effective embolization of cerebral arteriovenous malformations, precise and meaningful quantitative data regarding these properties are limited. Few previous studies have attempted to quantify the actual rate of polymerization of medical grade cyanoacrylates (ie, isobutyl cyanoacrylate and n-butyl cyanoacrylate) using indirect optical density measurements within small aliquots of plasma (18, 21, 22). These simple bench top tests showed nonlinear variability of polymerization time related to varying ratios of acrylic, iodinized oil, and acetic acid. However, the data derived from these studies are not directly transferable to clinical practice and are therefore of limited value. This is likely because of a variety of other important putative factors that may significantly influence polymerization time in actual clinical settings (4). This prompted us to develop a bench top testing apparatus that permits direct measurement of evolving binding forces that develop during polymerization of cyanoacrylates (23). The conditions in which polymerization and binding occur can be replicated and varied in a manner that more closely simulates those encountered in clinical practice. In this report, we describe the construction of this apparatus and the preliminary results observed after manipulating several putative parameters that are likely to have an important effect on cyanoacrylate polymerization and binding. A custom-designed testing apparatus was built to specifically evaluate polymerization rates and binding of cyanoacrylates under a variety of test conditions. The essential components of the apparatus are illustrated in the schematic provided in (Fig 1). A short tubular segment or “model vessel” of variable diameter and length is mounted on a low friction sliding bed fixed to a rail. The tubular segment can be either a plastic vessel or a surgically harvested artery. For surgically harvested arteries, each explant was kept moist with Ringer’s lactate solution. The tubular segment is clamped in a horizontal orientation to a vertical stainless steel post arising from the sliding bed. Aligned in the same horizontal axis, and in opposition to the fixed tubular segment, is a load cell assembly (227-g cell; Omega Engineering, Stamford, CT) linked to a clamp that fixes a short segment of a commercially available microcatheter. After the microcatheter is placed within the tubular segment, the segment is completely filled with some type of fluid (eg, plasma substitute [RPMI 1640 medium] or blood), ensuring that air is purged from the dead space. For the current set of experiments, no flow within the vessel was produced, although with slight modifications of the test apparatus, flowing fluid could be used as well. When ready to make measurements, the sliding bed is first very slowly withdrawn away from the load cell, using a modified Harvard syringe pump, and baseline tensile forces are recorded. Subsequently, a small aliquot of cyanoacrylate (0.1 mL) is injected with a 1-cc Luer lock syringe during a 1-s interval into the tubular segment in which polymerization and binding of the acrylic results in dynamic tensile forces that are applied to the load cell. The signal from the load cell is amplified by up to a factor of 103 using a DC amplifier. 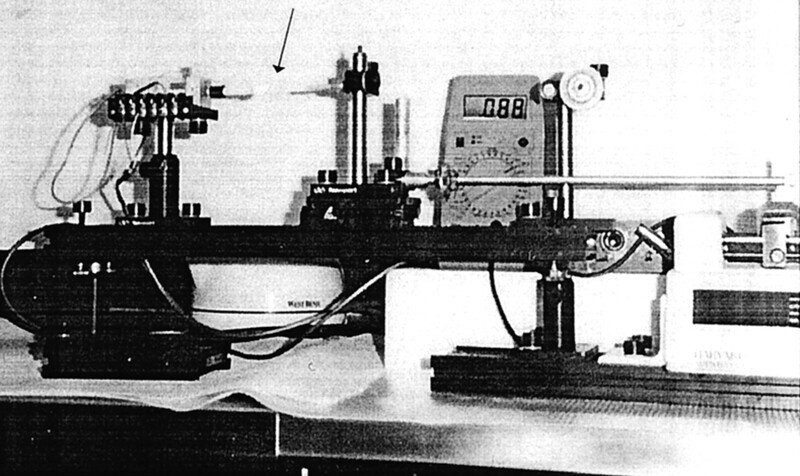 The actual test apparatus used for these experiments is depicted in (Fig 2). All experiments were conducted at an ambient temperature of 27°C. Schematic of dynamic test facility shows essential components of the apparatus. Photograph of dynamic test facility. Details of region indicated by arrow are shown in Figure 1. Traction device used to draw sliding bed away from load cell assembly can be seen at lower right. The apparatus was designed to permit direct calibration of the tensile forces by using a pulley system and calibrated weights. These and other details of the facility are shown in the photograph in Figure 2. Calibration of the apparatus was performed before and after each set of experiments. In the development of the test apparatus, a few basic variables had to be evaluated to determine the optimal conditions for reproducible and reliable measurement of tensile forces related to acrylic polymerization. These parameters included variations in the diameter and length of plastic tubular segments Tygon silastic tubing, speed of withdrawal of the microcatheter, and volume of cyanoacrylate used for each injection. For this initial set of experiments, various cut lengths (5–30 cm) of the distal portion of a commercially available 2.3-French microcatheter (Tracker 18; Target Therapeutics-Boston Scientific, Fremont, CA) were used. We also intentionally used a “non-coated” (ie, no hydrophilic coating) microcatheter to maximize the binding forces that may be generated (Tracker 18). Again, informal experimentation with these different cut lengths of microcatheter was needed to determine the optimal length for reliable and reproducible results. After numerous trial-and-error attempts, the basic components and settings of the test apparatus were finalized in terms of the above-described parameters (data not shown). This subsequently enabled us to systematically study the effect of different fluids within the tubular segment, the effect of the physical composition of the tubular segment (ie, plastic versus freshly harvested artery), and the effect of different formulations of cyanoacrylate. These putative factors were selected because of either their likelihood of having a significant impact on polymerization/binding mechanics in a clinical setting or their practicality for use in an experimental setting. For example, because polymerization of cyanoacrylates occurs through an electron donor, free radical exchange process (8), the chemical environment to which the glue is exposed is of critical importance. Thus, significant differences in polymerization/binding could occur in our model if plasma substitutes were used instead of blood or if the composition of the model vessels was plastic tubing rather than freshly harvested arteries (because of the different electron donor capacities of these materials). If no significant differences were shown, this would permit a more simplistic method of modeling and characterizing the behavior of cyanoacrylate polymerization, because it is safer, easier, and substantially more economical to conduct such investigations using plasma substitutes and plastic tubing. Consequently, we studied these potential differential effects by conducting the following experiments. First, using the same type and length (2.5 cm) of plastic model vessel (Tygon silastic tubing), either a commercially available plasma substitute culture medium (RMPI 1640 medium; ICN, Costa Mesa, CA) or citrated fresh whole blood (swine) was injected before the delivery of a short chain cyanoacrylate recently designed for clinical use (CES-nBCA; Cordis Endovascular Systems, Miami Lakes, FL). Although this agent was not commercially available at the time, we were kindly provided access to it by Cordis Endovascular Systems as a research materials grant. The second set of experiments consisted of using the same materials described above with the exception of comparing potential differences between a plastic model vessel and freshly harvested swine artery of comparable diameter and length. Under general anesthesia, each common carotid artery of a juvenile swine (20–30 kg) was surgically exposed and dissected free from the carotid sheath, typically yielding approximately 6 cm of useable length that could be divided into two to three segments for the ex vivo preparations. All harvested arteries were obtained immediately before the test apparatus experiments, being maintained in chilled RPMI 1640 medium perfused with oxygen to ensure viability of the tissues. These arterial segments were fixed to the apparatus with simple 4–0 silk ligatures. Because different cyanoacrylate formulations are likely to behave differently, we set out to determine the magnitude of qualitative and quantitative differences that could be detected with our test apparatus. This was accomplished by selecting the following cyanoacrylate formulations for measurement of polymerization bonding: CES-nBCA, Histoacryl (Braun, Melsungen, Germany), and Duro-5 (Loctite Corporation, Rocky Hill, CT). The first two formulations are medical grade n-butyl cyanoacrylates, and the last is an industrial formulation of methyl cyanoacrylate. For this set of experiments, we used 20-mm plastic vessels and RPMI 1640 medium placed within the same test apparatus as described above. The studies were conducted with model vessels of an internal diameter of approximately 3.0 mm and length of 20 mm. The volume of test fluid (ie, plasma substitute versus blood) used to fill the model vessel was approximately 0.3 mL. The length of the catheter segment used was 20.0 cm. The rate at which the catheter was withdrawn from the vessel was approximately 2 mm/min. This ensured that the geometry of the binding region around the catheter did not change significantly during the polymerization process. The volume of adhesive delivered into the model vessel was selected so that the injection only partially displaced the test fluid within the model vessel. This was determined to be approximately 0.1 mL. Although at present, we have no means of accurately measuring the duration of injection, it was estimated to be approximately 1 s. Because of the central location of the microcatheter within the tubular segment, polymerization/binding occurred only within the region where the two elements (microcatheter and vessel wall) were in contact with the cyanoacrylate. No significant distortion of the harvested arteries or plastic vessel segments was noted until the latest stage of polymerization/binding, which was likely the result of the very small incremental movement of the sliding bed and gradual development of tensile forces. 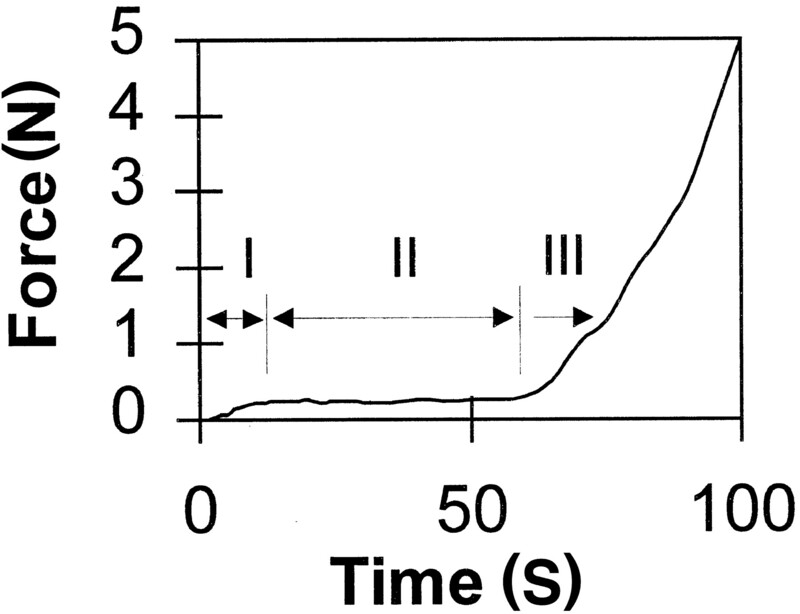 In all experiments, a multiphasic pattern of polymerization/binding was observed, consisting of three phases of distinctive force-time curves (Fig 3). An initial rapid polymerization phase, designated phase I, consisted of an approximately linear rate of increasing tensile forces. This phase generally lasted no longer than 10 s and was invariably followed by a second phase, phase II, of nearly constant tensile force, which lasted up to 1 min. In both phases I and II, there was incomplete polymerization, as evidenced by the lack of asymptotic rise in developing tensile forces. A final polymerization/binding phase, phase III, occurred when polymerization was completed. This phase was characterized by the rapid, exponential rise of larger tensile forces that were typically two to three orders of magnitude greater than the forces measured during phases I and II. Because of these substantially higher tensile forces encountered in phase III, direct measurements of the time-force curve were not possible, because the apparatus was designed for greater sensitivity in measuring tensile forces during the first two phases of polymerization/binding. This also prevented accurate measurement of the transition time interval between the end of phase II and the beginning of phase III. A simple vertical load-breaking apparatus was used instead to measure the strength of bonding after completed polymerization in phase III. These measurements showed bond failure loads in the range of 1.5 to 5.0 N, the latter being close to the failure load of the microcatheter. Schematic of evolution of polymerization forces. Multiphasic pattern of polymerization/binding, consisting of three phases of distinctive force-time curves, was observed in all experiments. Regardless of the type of cyanoacrylate that was used, a fairly stable pattern of phase I binding was observed when the experiments were repeated for a given formulation. In contrast, more variability was noted in phase II, which appeared to be most sensitive to subtle variations in injection conditions. An example of this is illustrated in Figure 4, in which an industrial formulation of cyanoacrylate Duro-5 showed periodic variation in measured forces during phase II in some experiments. Similar patterns were recorded when the two medical grade cyanoacrylates were tested (data not shown). Example of increased variability noted in phase II, which appeared to be most sensitive to subtle variations in injection conditions. Evolution of binding forces of industrial cyanoacrylate injected into plasma substitute is shown. The influence of the surrounding liquid medium on polymerization was substantial. The results of CES-nBCA injection into RPMI 1640 medium versus swine blood are shown in Figure 5. The rates at which the force developed for these fluids were 0.007 and 0.034 N/s, respectively. Unexpectedly, our experiments also showed no measurable difference in polymerization/binding between freshly harvested swine arteries and the Tygon plastic tubing filled with RPMI 1640 medium force development of approximately 0.007 N/s for each. 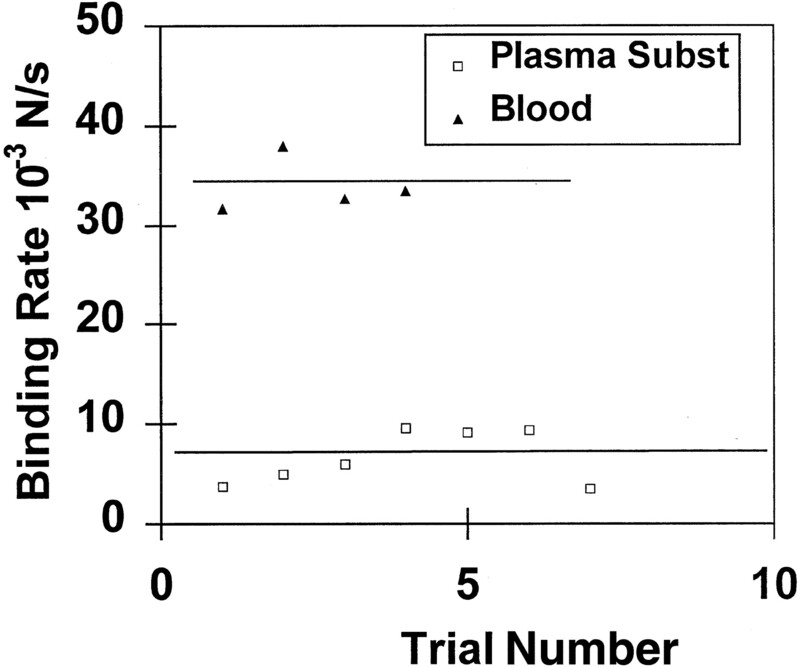 Illustration shows influence of plasma substitute and blood on CES-nBCA polymerization. Subst, substitute. Significant differences in polymerization/binding were observed among the different formulations of cyanoacrylate tested. These differences were best shown by comparison of the time-force patterns observed in phase I, in which the rate of tensile force development was calculated. The Duro-5 formulation was found to have a phase I binding rate of 0.008 N/s, whereas, as shown in Figure 6, the phase I rates for CES-nBCA and Histoacryl were 0.007 and 0.023 N/s, respectively. Phase I polymerization rates for CES-nBCA and Histoacryl in plasma substitute. Despite the many technical and clinical advantages of cyanoacrylates for therapeutic embolization of cerebral arteriovenous malformations, complications are still common. It is generally considered that such complications unfortunately are often the result of unpredictable attributes of this embolic agent 4, 5, 20, 24, 25. However, the precise nature and magnitude of this problem has remained poorly defined. To some degree, this unpredictability is related to an incomplete understanding of the underlying mechanics of polymerization and binding, particularly when applied in a dynamic living system (4). As noted earlier, there are likely several putative factors that could profoundly impact polymerization and binding in a clinical setting. These include various angioarchitectural (eg, individual and collective geometries of target vessels, branching pattern, size distribution, compartmentalization, etc.) and hemodynamic (eg, shunt flow, disturbed/turbulent flow) characteristics of the cerebral arteriovenous malformations, as well as technical aspects of the superselective catheterization and embolization (eg, “free flow” or “wedged” injections, rate and volume of injection, etc.) (4, 5, 22). For example, fistulous components within an arteriovenous malformation nidus have been widely acknowledged as an important risk factor for inadvertent occlusion of the major venous outlets of cerebral arteriovenous malformations (which may lead to an intracranial hemorrhage) when using liquid adhesives (4–6, 9, 26–28). These fistulous components often pose a considerable technical challenge to effectively eliminate because of a combination of the turbulent super-physiological hemodynamics associated with the low pressure/high shunt flow within the compartment and the frequent receptive dilation of the feeding artery and/or draining vein. To compensate for these difficulties, the operator must make a variety of technical adjustments in the delivery and formulation of the acrylic mixture to minimize the risk of complication related to distal non-target delivery. Of course, the chemical interactions of the specific cyanoacrylate and surrounding liquid media (both inert and reactive) also likely have a considerable impact on the behavior of this type of embolic agent (4, 5, 18, 22). These chemical interactions comprise the initial step in translating the basic chemical reaction of monomeric activation and chain polymerization into the actual physical behavior of progressive solidification and bonding within targeted vasculature. Again, the rate and magnitude of these chemical reactions are likely dependent on several factors, including rate of mixing, intrinsic flow, volume and quality of media within targeted vasculature, and geometric configuration of targeted nidal vessels (5). Therefore, because of the multitude of variables potentially at play, a methodology for a more systematic and quantitative analysis of these parameters would be highly desirable. This would allow for a more thorough understanding of the relevant polymerization-bonding mechanics of cyanoacrylate embolic mixtures, both comparatively and in general. Unfortunately, few if any rigorous efforts have been previously made to conduct such studies, leaving clinicians with little scientific data regarding the important physical properties of these embolic agents. A few previous studies have used relatively simplistic static models to evaluate differences in so-called “polymerization times” when varying mixtures of cyanoacrylate, iodinized oil, and acetic acid (18, 21, 29). This polymerization time was determined by a relatively crude measurement of changes in optical properties (ie, change in transparency) of a drop of adhesive mixture placed within a pool of plasma (18, 21). Although such experiments were able to show measurable differences in polymerization time among the various combinations of “ingredients,” they have failed to correlate well with empiric clinical observations (4, 6, 21, 23). There may be several possible reasons for this poor correlation; however, it is our premise that the most important factor is the apparent lack of an established relationship between polymerization-induced changes in optical properties (ie, optical density) and the dynamic mechanical properties of the solidifying mixture (the latter being largely a function of the intrinsic and extrinisic binding properties of cyanoacrylate). Consequently, we sought to develop a methodology with which to study these properties. The current experiments determined the polymerization rate from a direct mechanical measure of tensile force generation due to bonding, rather than from crude measurements of variations in optical density. For such a methodology, we assumed that the tensile force dynamics of cyanoacrylate binding can be predictably linked to polymerization, providing that the dynamic binding force is a measure of an increasing Young’s tensile modulus. Furthermore, it must be assumed that for the time scales likely operating for these experiments, there is effectively simultaneous progressive cross linking of the linear chains of polymerizing monomer. This approach theoretically has the distinct advantage of measuring the most direct link between chemical reaction and physical behavior of the solidifying fluid. Furthermore, the liquid adhesive is used in a manner similar to its actual use in clinical practice while at the same time requiring only small quantities of adhesive, blood samples, and plasma substitute per injection. There are other significant differences between previous static polymerization studies and the current investigation. First, previous studies, such as the one presented by Brothers et al (21), used relatively large quantities of serum for the ion donor medium compared with the volume of liquid adhesive mixture. This methodology has significant implications related to the chemistry of cyanoacrylate polymerization, which is fundamentally an anionic chain reaction initiated by electron donation to an acrylic monomer (30). Such a chemical reaction is highly dependent on a large source of free anions, which in the case of these previous studies was essentially unlimited. Hence, polymerization of the cyanoacrylate formulations previously tested would be expected to be very rapid, which was the reported experience (as fast as 50 ms). However, in actual clinical practice, various intrinsic (eg, flow rate, nidal geometry) and extrinsic (eg, wedge versus free flow microcatheter injections) conditions will likely limit either the gross or net supply of anions available for reaction when delivered into an arteriovenous malformation nidus. For example, wedge injection of a liquid adhesive mixture within a small compartment of an arteriovenous malformation nidus would likely result in exposure of the cyanoacrylate to relatively little electron donor species normally abundant in the blood serum. This is because of the combined effect of a relatively small volume of intravascular medium already present and the lack of significant replenishment of medium from the catheter-induced occlusion of the proximal feeding pedicle. Our experimental apparatus was intentionally designed to permit variation in the quantities of available anionic donor fluid to evaluate this particular variable. For the current preliminary studies, we limited the supply of negative ions supplied by the intravascular medium in an attempt to extend the range of observable polymerization. This strategy enhanced detection and measurement of the polymerization-binding mechanics occurring within the model vessel. As expected, the measured polymerization was accordingly slower, with phase I lasting from 300 ms to 1 s and phase II lasting ≤60 s.
Interestingly, we were surprised to find that there were essentially no differences in polymerization rates and tensile force generation when the same cyanoacrylic formulation was used in a plastic model vessel versus an ex vivo native artery harvested from swine. We had theorized that the negatively charged endothelial lining of a living artery could be a significant anionic source for initiating and sustaining polymerization. Although this could still be true under wedged injection into a relatively large nidal compartment, our experiments indicate that in most cases, it is the intravascular medium (ie, blood serum) that provides most of the source of reactive anionic species. An unlikely alternative explanation for the lack of differences in polymerization rate between plastic and ex vivo vessels is that the former possessed approximately equal small quantities of polymerization initiators (eg, cations) and inhibitors whereas the latter possessed approximately equal large quantities of both. Our test apparatus also provides additional insight and possible validation of a recent study (29) of cyanoacrylate bonding of microcatheters to an embolized artery. In that study, Mathis et al (29) measured static binding forces generated when a catheter fully bonded to a model artery. They found that microcatheters with hydrophilic coatings were significantly more resistant to inadvertant bonding. In the context of the current studies, is a problem of the late phase of the binding mechanics. In this phase, our own additional studies have shown that the breaking load does not significantly depend on the type of adhesive used or on the medium (blood or plasma substitute) into which the adhesive was injected (unpublished data). Based on these in vitro experiments, the first two phases of tensile force generation resulting from polymerization of cyanoacrylate provides an explanation for the peculiar behavior of very dilute suspensions of this adhesive when injected under wedged conditions. Chaloupka and Putman (4) previously hypothesized that during wedged injection conditions for arteriovenous malformation embolization, the relatively small volume of targeted vasculature is “flooded” with the liquid adhesive mixture. In such a situation, there is little availability or mixing of any electron donor species to initiate polymerization, except at the perimeter of the advancing embolic bolus. Consequently, a thin outer “skin” of polymer is formed that contains an inner liquid embolic mixture (unpolymerized cyanoacrylate). This thin skin is easily ruptured by the rise in intraluminal pressure generated by slow injection through a syringe, resulting in continuing propagation of the embolic bolus into multiple nidal vessels. From these preliminary studies, a potentially important observation has been made regarding the differences in rate of polymerization-induced binding between Histoacryl and CES-nBCA (0.023 and 0.007 N/s, respectively). With our test apparatus, it seemed that CES-nBCA polymerized and bonded approximately four times slower than did Histoacryl during phase II. Although, precise clinical correlation of this difference may be difficult to extrapolate at this time, this finding suggests that these two formulations of n-butyl cyanoacrylate may exhibit different physical properties when injected in both free flow and wedged conditions during embolization. 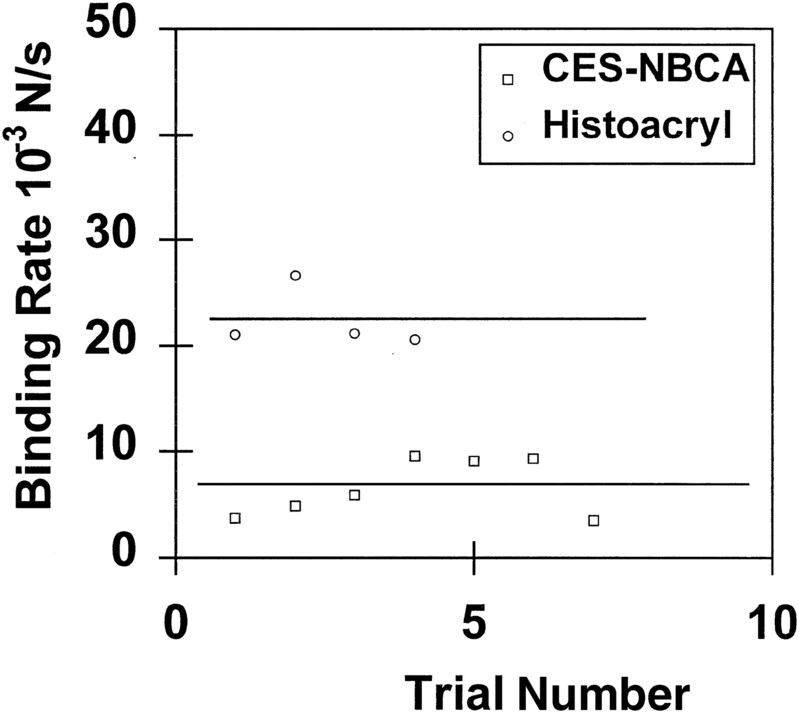 Although it would be premature to make authoritative recommendations at this time, such a difference in rate of polymerization between CES-nBCA and Histoacryl observed in our experiments suggests that operators who have become familiar with the polymerization properties of Histoacryl may need to modify their embolization strategies/techniques when using the CES-nBCA formulation. With the recent Food and Drug Administration approval of CES-nBCA, these observed differences in polymerization will need to be more carefully evaluated. We acknowledge that in the present studies, the details of the model artery, injection region, and flow conditions did not correspond exactly to real clinical conditions. In particular, the parameters of flowing anionic medium and model nidal vasculature (ie, plexiform network of terminal vessels) were not used. This was a pragmatic compromise necessary to initially evaluate the basic feasibility and validity of this new test apparatus, because introduction of these latter parameters would have been too complex for the stated purpose of the study. Fortunately, our apparatus can be modified to incorporate these and other putative factors, allowing for possible exploration of variations to make it more realistic to clinical practice. Another limitation of the current studies was our inability to accurately measure the transition time between the end of phase II and the beginning of phase III because of the rapid change in scale of evolving tensile forces generated during polymerization. This phase likely represents the final “curing” process of cyanoacrylate polymerization, when the polymer has already achieved a mostly solid phase through extensive cross linking. Although accurate characterization of this process may be useful from a materials science perspective, it unlikely has much clinical significance because the polymer has already become mostly solid by the end of phase II (and therefore likely has already occluded the targeted vessel). Nonetheless, the transition time between phases II and III of polymerization bonding may be measurable with our apparatus using two different stain gauges of different sensitivity magnitudes, which we plan to evaluate in the near future. We have developed a relatively simple bench top testing apparatus that consistently measures the dynamic binding related to polymerization of cyanoacrylates. The preliminary use of this model to study the mechanics of cyanoacrylate polymerization-binding revealed a complex multiphasic pattern of chemical or physical behavior. These observations may provide important insights into the clinical behavior of cyanoacrylate embolic mixtures. Additional studies are needed (and planned) to more completely evaluate those phenomena and their clinical implications.